Two of the most common appearances of SCP-2077. 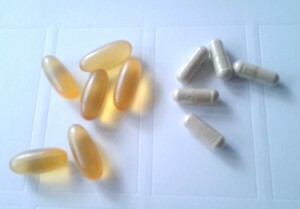 Soft capsules on the left contain fish oil, while capsules on the right contain bone meal. Special Containment Procedures: All drug retailers are to be monitored for instances of SCP-2077. Confirmed instances are to be confiscated and tracked to their source of origin if practicable. Human consumption of SCP-2077 is to be discouraged via campaigns and outreach programs intended to educate individuals on the dangers of unregulated imported prescription drug use. The Foundation is to maintain and distribute functioning generics of brand-name norepinephrine reuptake inhibitors (NRI), selective serotonin reuptake inhibitors (SSRI), and non-steroidal inflammatory drugs (NSAID) via the front company "Sunrise Care Practitioners" in designated "hot spots" where instances of SCP-2077 have been reported. Description: SCP-2077 refers to a number of capsule and tablet pills variously advertised as analgesics, anti-anxiety drugs, anti-depressants, and anti-convulsants, manufactured by an unlicensed company going by the name "The Stuff Industry" and represented by a logo of a crudely drawn house with a shining sun perched atop the roof. While the pills appear to function as advertised, analysis of the pills' contents show that each capsule is apparently filled with objects ground into powder and filled into capsules, including glass, quartz, plant matter, volcanic ash, sugar, bone meal, and owl pellets. Tablets are similarly composed of granulated matter or solid waste in a polymer coating. Capsules of SCP-2077 that are emptied of their contents do not retain their effects when consumed. Instances of SCP-2077 first appeared in █████████, Malaysia, in which ██,███ kilograms of capsule and tablet pills from "The Stuff Industry" were confiscated as part of a drug bust. Analyses found no legitimate medicinal components within the pills, and much of the confiscated instances were destroyed before coming into Foundation custody. Further instances of SCP-2077 began to spring up throughout Southeast Asia, India, Australia, China, and South America sporadically. Front portion of Subject D-██████ shed during experimentation. Continued use of SCP-2077 sees additional effects take place over a 2-4 week period. During this period, portions of an individual's body, ranging from hair and skin cells to layers of subcutaneous tissue, begin to part from the individual overnight while the body begins to regenerate lost tissue. The longer an individual remains on SCP-2077, the greater portions of their body begin to be replaced. Organs and tissue matter replicated are genetically identical to the original tissue, with the exception of being free or otherwise unaffected by the disease and/or injury supposedly being treated by SCP-2077. Subjects using SCP-2077 have often reported being unable to identify portions of their own body, displaying symptoms consistent with Gerstmann's syndrome1 and/or autotopagnosia.2 Subjects often have difficulty coordinating and determining distance between objects and their own limbs, due to being unable to recognize their own limbs as a part of themselves. Subjects viewing themselves in a mirror tend to have less difficulty coordinating, though remain unable to identify specific parts of their body, typically indicating the general area of its location. A group of 150 Class-D personnel were selected to ascertain the method of operation of SCP-2077. They were selected and grouped based upon physical and mental afflictions. Group 1 was told of the reported effects of SCP-2077 and were administered placebos. Group 2 was told of the reported effects of SCP-2077 and were administered capsules of SCP-2077 emptied of their contents. Group 3 was told of the reported effects of SCP-2077 and were administered the contents of SCP-2077 placed in different capsules. Group 4 was not told of the reported effects of SCP-2077 and were administered unaltered capsules of SCP-2077. Group 5 was told of the reported effects of SCP-2077 and were administered unaltered capsules of SCP-2077. This is the control group. Testing unfolded over the course of 3 months. 3 Weeks No reported effects. 6 Weeks 11 of 30 subjects claim to be recovering. No measurable improvement has been found. 9 Weeks No reported effects. 12 Weeks No reported effects. 15 Weeks 5 subjects claim to be "cured" of their mental afflictions. Psychological evaluations indicate this to be false. No further result has been detected amongst the group. 3 Weeks One subject experiences chest pains. Determined later to be unrelated to experiment. 15 Weeks No reported effects. 3 Weeks 6 subjects complained of stomachaches and suffered from brief gastrointestinal issues. Later determined to be due to reaction to SCP-2077 contents. 6 Weeks 19 subjects report small improvements in overall health. No measurable improvement has been found. 9 Weeks One subject briefly hospitalized due to increased level of sodium caused by SCP-2077 contents. 3 Weeks 28 of 30 subjects experience effects of SCP-2077, including loss and duplication of fingernails and teeth, followed by layers of skin and fat. Footage of the subjects sleeping indicate deep abscesses forming on skin, which burst and cause the layers of skin and fat to come away. When blood is rinsed away, skin and flesh appear as normal. Shed body parts are disposed of while subjects remain asleep. One subject reports significant clearing of acne. 6 Weeks 14 of 30 subjects experience loss of limbs, replaced with duplicated copies. All affected subjects report "serious difficulty" coordinating with new limbs, and some reportedly are unable to perceive any tactile sensations with their replaced limbs. 9 Weeks All 30 subjects have experienced some loss and replacement of body parts, with 7 reported incidents of regurgitation of organs, including kidneys, pieces of the liver, and gallbladder. 12 Weeks 4 of 30 subjects are reportedly "cured" of their afflictions, including eczema, cirrhosis of the liver, renal failure, and insomnia. 15 Weeks 25 of 30 subjects now report being "cured" of their afflictions, including all mental afflictions. 21 of the 25 report being unable to identify parts of their body, with some likening it to having prosthetic limbs. 3 of the remaining subjects believe they have died and have been replaced into new bodies. One remaining subject claims to be two distinct individuals in one body. 3 Weeks Results as expected. 6 Weeks Results as expected. 9 Weeks Results as expected. 12 Weeks One subject who had not been responding to SCP-2077 suffered a full-body duplication. Subject claimed SCP-2077 to have given them a "second chance at life" and to be the work of "divine intervention." Subject displayed severe symptoms of autotopagnosia and lost all mobility below the waist. Addendum: Extreme cases of SCP-2077 consumption3 can result in the individual's entire body being "duplicated", with the "original" body coming away lifeless, leaving the subject within their "duplicated" body. Subjects in this state suffer from severe depersonalization, often experiencing distinct changes in behavior and personality while retaining memories and life experiences. One subject claimed that use of SCP-2077 has "killed" them, and in effect created a perfect living copy of themselves. In at least 3 documented cases, subjects have described feeling as if they are "entirely different" people, able to recall personal events while being able to discern between "themselves" and their "former selves". 1. A cognitive impairment typically resulting from damage to the left hemisphere of the brain. Characterized by an inability to distinguish left from right, difficulty in writing and understanding mathematics, and difficulty distinguishing the fingers on the hand. 2. A form of agnosia, indicating an inability to recognize or orient different parts of one's own body.